This Friday, August 15, marks the Solemnity of the Assumption of the Blessed Virgin Mary. It marks when the Blessed Virgin was taken up by the Holy Trinity, body and soul into glory. The significance of this mystery should not be understated. As the Directory on Popular Piety and the Liturgy (Directory) states it, “This is an ancient memorial of the Mother of God, which signifies and synthesizes many of the truths of the faith” (Directory, 180). Popular piety surrounds this Solemnity with great fervor and devotion all over the world. “In many places the feast is synonymous with the person of Our Lady, and is simply referred to as “Our Lady’s Day” or as the “Immacolada” in Spain and Latin America” (Directory, 181). Among the towns and villages of Italy, processions take place throughout the streets. Of course, no procession is complete without music, and so, in Portugal, the Romeria is celebrated. Its signature is a brass band accompanied by drums and bagpipes. In Portugal, though, an interesting twist is that the image of Our Lady of the Angels is crowned – I can see that. In the Germanic countries, the custom of blessing herbs is associated with August 15. This custom, received into the Rituale Romanum 200, represents a clear example of the genuine evangelization of pre-Christian rites and beliefs: One must turn to God — through whose word “the earth produced vegetation: plants bearing seeds in their several kinds, and trees bearing fruit with their seed inside in their several kinds” (Gen 1:12) — in order to obtain what was formerly obtained by magic rites, to stem the damages deriving from poisonous herbs, and to benefit from the efficacy of curative herbs. This ancient use came to be associated with the Blessed Virgin Mary, in part because of the biblical images applied to her such as vine, lavender, cypress, and lily; and in part from seeing her in terms of a sweet-smelling flower because of her virtue; but most of all, because of Isaiah 11:1 and his reference to the “shoot springing from the side of Jesse,” which would bear the blessed fruit of Jesus. It is here considered a day for betrothals, when young men and women come to ask her blessing on their future. The image of the Virgin is placed at the church door during the day, and at night carried into the village square, later to be returned in procession to her shrine. Then, to the light of bonfires and the music of bagpipes, young people dance and make merry. Popular piety is manifested through traditions which are practical ways to introduce to culture the importance of this Solemnity as well as emphasize its theological significance. 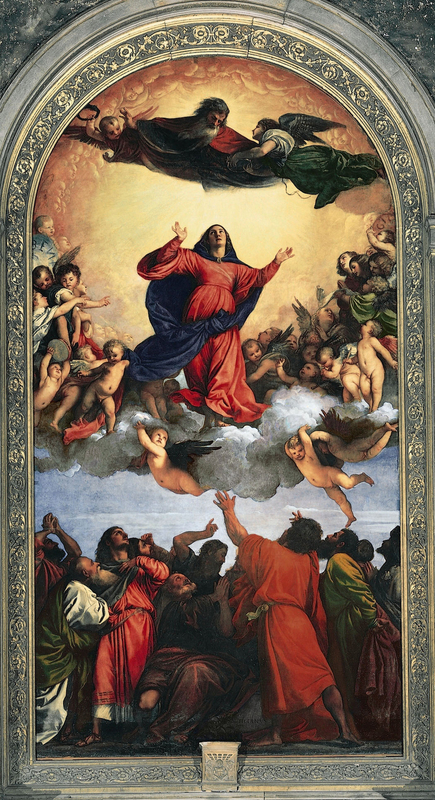 The Assumption is for all humanity the greatest witness to the efficacy of Christ’s salvation, a pledge to the future glory promised to us by the Father, a guarantee of the Lord’s faithfulness to fulfill his promises for the humble and lowly, and a consolation and signpost of hope that one of us, in the flesh, has already been brought into heaven and we, too, are called to such a dignity. Queen Mary, assumed into heaven, pray for us who have recourse to thee! Katherine Burton and Helmut Ripperger, Catholic Activity Assumption Day Traditions: August 15, CatholicCulture.org, accessed August 12, 2014, http://www.catholicculture.org/culture/liturgicalyear/activities/view.cfm?id=1142. This entry was posted in Deacon Marques Silva and tagged Assumption, Assumption of Mary into Heaven, Blessed Virgin Mary, BVM, Catholic art, Catholic culture, Catholic customs, culture, customs, faith, Mary Our Mother, Our Lady, piety, rituals, symbolism, symbols, wedding customs, weddings. Bookmark the permalink.